Small - $400.99 Only 6 left! Medium - $400.99 Large - $400.99 Only 6 left! The world is a beautiful but complicated place. While we all strive to set things right, it can be frustrating to watch the world's troubles unravel out of our control. You might help where you can. You donate to the charities. You stand up for those who might be suppressed. There are even those times when you volunteer with your community. But wouldn't it be awesome if you could lift off from the ground and take action against the big, bad, and powerful in the world? Maybe that's why we love Wonder Woman so much. She's a superhero that recognizes problems big and small. While she might have looked over the small village being threatened while she was looking for Ares, she simply couldn't. She felt for the women and children and needed to use her power to protect them! 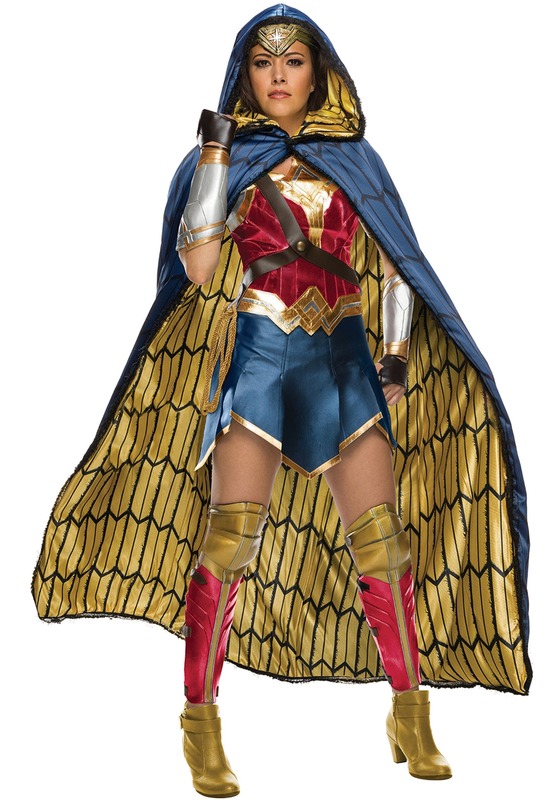 Feel confident and powerful in this unique take on a Wonder Woman costume. The corset has a shiny surface with the classic stitched eagle design belt and gold chest detail. The skirt is layered over boy shorts so you don't have to worry about modesty while you're setting villains straight. The cape is dramatic with a gold patterned lining and an oversized hood. You'll also get the dignified molded tiara, silver and gold gauntlets that are layered over black-pleather fingerless gloves, and a red and gold boot toppers. The rest is topped off with a golden lasso, a sword, and a shield. We all have a reason to want to become Wonder Woman. We all have someone to stand up for. You might as well go all the way with this awesome blue and gold ensemble. Whether you're dressing up for a superhero-themed party, heading to a comic book convention, or going all out for your next costume party, this will be the ultimate choice that you can wear again and again. Whatever your strength might be, flaunt it with this gorgeous Wonder Woman costume.